An acrylic adhesive for swimming pool and spa repairs that sets up in just 5 minutes! 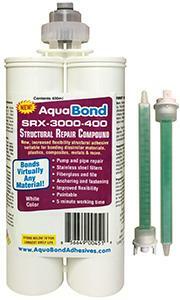 When you need a fast and strong adhesive for repairs around swimming pools, spas or water features, AquaBond® SR-3000 Structural Repair Compound is what to reach for! 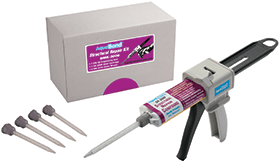 Great for making emergency repairs, rapidly repairing swimming pool tiles — and much, much more! 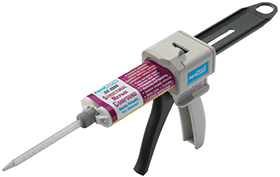 This professional, two-part acrylic adhesive hardens in just 5 minutes and allows you to quickly anchor, fasten or make structural repairs to just about anything around pools and spas. 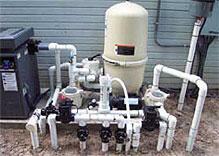 Make emergency structural repairs to almost anything around pools and spas! static mixer tips as needed. NEW! Our new, INCREASED FLEXIBILITY 400ml structural adhesive that’s suitable for bonding dissimilar materials, plastics, composites, metals, concrete and more. FOR Structural Repair SRX-3000-400 Only.